United Arab Emirates: Jamalon, the Middle East’s largest online book retailer, has taken the next step on its mission to revolutionise the region’s literary industry. The company is attending the Sharjah International Book Fair, where it has begun to collect titles from publishers to stock in its new UAE warehouse which is due to open in 2017. With a storage capacity for up to 250,000 books, the new warehouse is set to be the largest facility of its kind for Arabic publications in the region, enabling Jamalon to strengthen its position in the Middle East and expand its reach even further into the international market. Jamalon will also be introducing regional and international publishers at the book fair to its ground-breaking Print on Demand (POD) service. Launched earlier this year, Jamalon POD harnesses the latest digital printing technology to offer numerous advantages to both local publishers and international publishers who wish to target a MENA audience. Compared to traditional offset printing, Jamalon POD can offer smaller print runs, shorter delivery times and the elimination of international shipping fees, reduces costs caused by warehousing and cross-border distribution logistics, and enables publishers to print titles in direct response to orders. 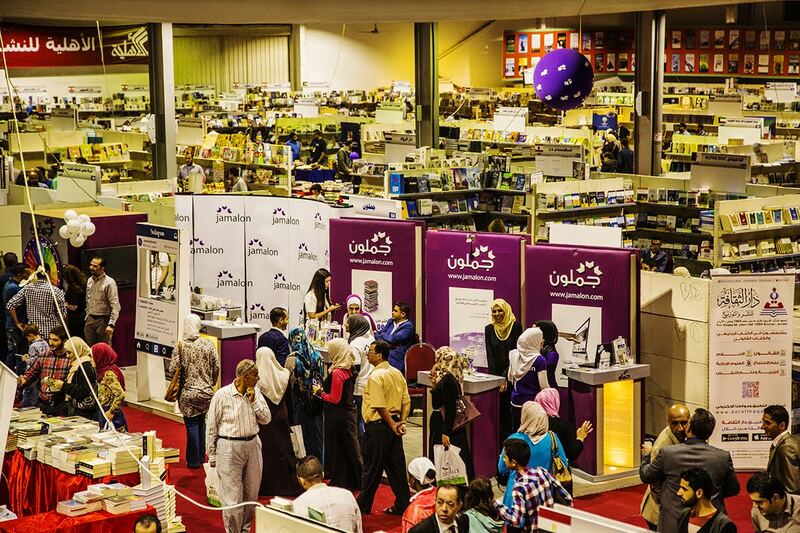 “As a homegrown business, the Sharjah International Book Fair is an incredibly important event for Jamalon,” explains Ala’ Alsallal, Jamalon Founder and CEO. “We are looking forward to meeting with the many publishing professionals, authors and literature enthusiasts in attendance at the fair, and introducing them to the latest innovations at Jamalon which are revolutionising the region’s publishing and book buying industries.” Now in its 35th year, the Sharjah International Book Fair is considered to be one of the region’s most prestigious literary events, attracting visitors from across the world and hosting some of the biggest names in publishing. Last year’s fair saw over 1,500 publishing houses from 64 countries with more than 1.5 million books on display, while 1.2 million people visited the fair during the 11-day event. Founded in 2010 by Jordanian entrepreneur Ala’ Alsallal, Jamalon has grown to dominate the Middle Eastern publishing industry. Last year, the company raised Series A of $3.7 million in investment, and is on track to raise a further $10 million Series B in 2016. Initially a small family business, today the company employs 70 staff, distributes books across the world and has a presence in Dubai, Amman, Beirut and London. As the company expands, Alsallal hopes to empower the region’s publishing houses, authors and small businesses by redressing the imbalance that exists in Arabic book publishing – until today, the Arabic nation has produced over 1 million Arabic language books, yet only 300,000 are available to purchase in the Arab world, a problem that is currently being solved by Jamalon POD. With the mission to make a diverse selection of Arabic titles available to readers across the region, plus delivery and payment terms tailored to the local market, Jamalon currently offers 10 million Arabic and English titles to 22 countries in the Middle East and North Africa. According to Jamalon sales figures, the Middle East’s top five countries for reading are: Saudi Arabia, United Arab Emirates, Jordan, Kuwait and Oman. Seventy-five per cent of Jamalon’s book sales are to readers aged 18 to 34, with two thirds of the company’s books sold to male readers. Currently, the top three categories of books sold through Jamalon are novels, self-help or personal development, and politics. Alsallal originally launched the company to combat illiteracy rates in the region and expand the Middle East’s access to knowledge and opportunities for learning. His mission and vision are in line with the UAE’s own ambitions to position the country as a global capital of culture and knowledge. 2016 has been declared the ‘Year of Reading’ by United Arab Emirates President His Highness Sheikh Khalifa Bin Zayed Al Nahyan, with the aim of promoting reading among Emiratis of all ages, and to create the next generation of book lovers. This year, the UAE government has also announced the launch of a new ‘reading law’, an unprecedented cultural initiative which will scrap fees for distributing, publishing and printing reading materials, create new facilities for authors and publishers across the Emirates, and legalise dedicated reading time in the workplace. Launched in 2010, Jamalon.com is the largest online bookstore in the Middle East and North Africa, offering 10 million titles of Arabic and English books. Uniquely adapted to the regional market, the company has a bilingual Arabic-English interface, payment via local currencies and the option of cash on delivery, thanks to a strategic distribution partnership with Aramex.